Mass enthusiasm for combat sports has led to the situation where even in self-defense systems people divide a fight with a weapon from a fight without a weapon. But the most interesting fact is that according to public opinion, a fight with a weapon needs a completely different set of skills and training than a fight without a weapon. In fact, there have appeared different currents that specialize only in fighting with weapons. All that greatly confuses people who want to learn how to defend themselves. But in real life a fight is a fight. It doesn’t matter whether you have a weapon or not, or whether you’re attacked by someone who has a weapon – it can lie on the ground or be in the hands of the attackers, or somewhere else. There is no difference. All the rest are additional instruments. It’s great if you have them; if not, you can take them from your opponent. 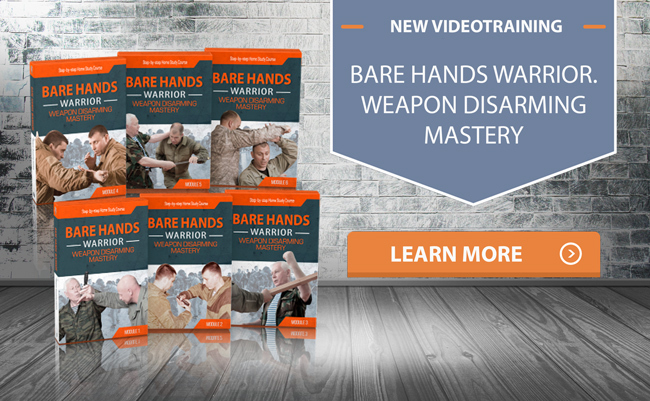 …you’ll know exactly how to FIGHT WITH A WEAPON. You won’t depend on them while fighting, they will be just additional instruments for you. because you’ll be guided by the principles that remain the same; you can fight with a weapon or be attacked by someone who’s carrying a weapon. What do you think a person who is attacking you is focused on mostly? Of course, on their weapon! That’s true. They think that by possessing a weapon they can do anything they want. They think that you should be afraid of their weapon. If you were trained in such a way that you think that in order to fight someone who is holding a weapon that you need completely different skills, then they were right. If a person is completely dependent in a fight on their weapon, then their plan of attacking means just using that weapon. If their weapon is lost while fighting, then they will need to change their principles of the fight in order to not let a victim go. In fact, if they lose their weapon, they may change their mind and just run away. That’s why your skills should be universal. 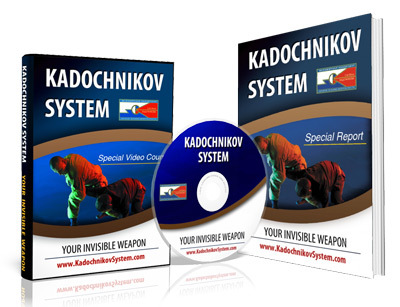 That’s the approach of the Kadochnikov System. 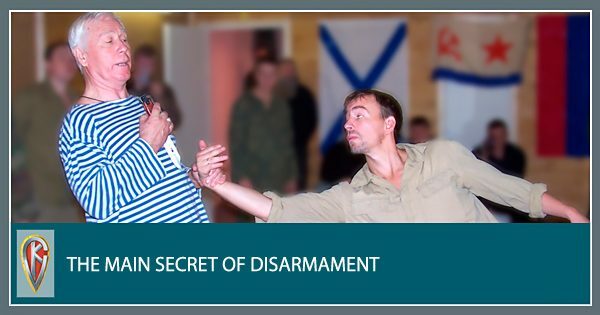 That’s why the Kadochnikov System pays so much attention to how to use weapons correctly in order not to lose one’s focus. What you’re holding in your hand shouldn’t distract you. It’s just an instrument, which is controlled by your brain. If you understand how to fight with a weapon correctly, you’ll also understand how to win over a person who is attacking you with a weapon. And more than that, such an understanding will increase the chances of your survival in the situation where someone is attacking you without a weapon. So, in what way will you be training? Will you fight with a weapon… or will you be a person who knows how to fight with the help of a weapon?